MANILA — Each night, police in teams of about a dozen fan out across the most rundown areas of the Philippine capital, rounding up slum-dwellers who linger in the streets, or teenagers who play in makeshift computer gaming shops. This is a war on loitering — instigated by Philippine President Rodrigo Duterte, famous for his bloody war on drugs and his obsession with social order. The crackdown has been condemned by activists, legal groups and opposition lawmakers, who say it has no legal basis as vagrancy was decriminalized in 2012 and that Duterte is again harassing Manila’s poor, already traumatized by the war on drugs. “This is all about imposing control on the poor, by using force or the threat of force to intimidate them. What for? The intention is to keep them from resisting, from fighting back,” said Antonio Tinio, an opposition Congressman. But Duterte, who says the anti-loitering crackdown is a “crime prevention campaign”, has not suffered any backlash. His public support ratings, built on the back of his reputation as a disciplinarian who gets things done, remain high. A Pulse Asia poll conducted last month showed 88 percent of Filipinos approved of Duterte’s performance as president. Formerly a mayor for two decades, Duterte built his career on his ‘tough-on-crime’ image. When he ran for president, he promised to kill thousands of narcotics dealers. In his two years in office, police have done just that, killing at least 4,500 people they say were drug suspects who resisted arrest. In his annual State of the Nation Address on Monday, Duterte vowed the war on drugs would continue to be “relentless and chilling”. 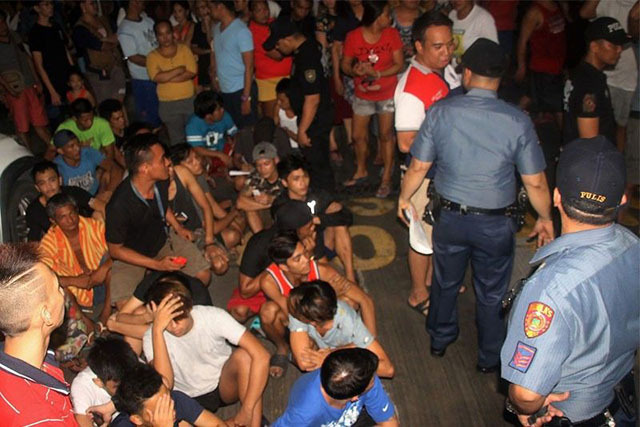 Since then, fewer people are being held overnight or longer in Manila’s notoriously overcrowded police station cells. Most are booked and freed, about a third are fined and some are charged with offenses. Vice President Leni Robredo, elected separately to Duterte, says police now have a license to abuse and lawyers should help poor communities to know their rights. The National Union of Public Lawyers has likened the campaign to martial law under Ferdinand Marcos from 1972 to 1981. “Such police state tactics were historically experimented or resorted to by fascist dictators to ultimately silence critics and resistance,” it said. He argues the measures are legal as he can invoke the principle of “parens patriae” (parent of the nation), and recently told police to follow orders and ignore “deranged constitutionalists” questioning the legality of the drive. Mark Lopez, a pro-Duterte blogger, said crime was a big problem and the public welcomed Duterte’s approach, regardless of what his opponents say. While two inmates have been charged over Argoncillo’s death and five police removed, outrage over the crackdown has been limited. One exception was the arrest of several call center workers chatting on the street having just finished their night shift. The news went viral and two officers in Manila’s main business district were fired. “They (the police) made us watch the declaration of President Rodrigo Duterte about the anti-loitering law… They told us, ‘because the president said it, it is immediately a law’,” one of the workers wrote on her Facebook page.